Members of the Glencoe Silver Lake supermileage team placed third out of 15 teams in the electric car category at the 30th annual supermileage challenge at Brainerd International Raceway. The team qualified by completing six runs in under 24 minutes with the goal set on being as efficient as possible. On the three-mile track, they averaged 56 watts per six miles. They also placed top 10 in the modified and E-85 engine categories. 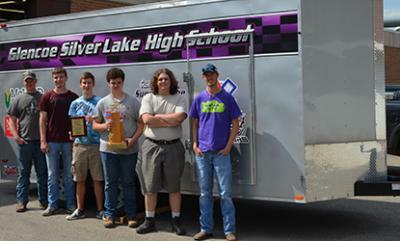 Pictured, from left, Mitchell Bondhus, Adam Thalmann, Isaac Swift, Jon Ramige, Greg Boyum and Blake Ortloff.